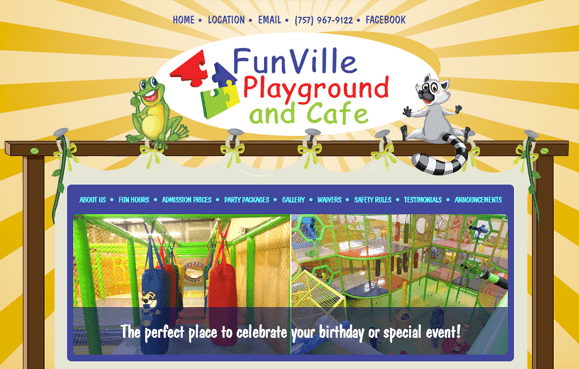 Website design for arcades playgrounds cafes | VISIONEFX creates great web design for a small businesses in Virginia Beach. Once you land on the main Fun Ville custom designed home page you may choose to visit the Chesapeake VA or Virginia Beach location. This recent web design Chesapeake VA project for Funville provides a competitive branded website presence in a highly competitive space. VISIONEFX has great Google Reviews from verified customers posted on ‘Google My Business pages’. We invite you to read our reviews and contact our website customers. They will tell you our web design and web maintenance services are second to none. For great branded website design for your building or contracting business builders call the website design experts at 757-963-1787 or use our online contact form here.